Finland's entire government has resigned over its failure to achieve a key policy goal on social welfare and healthcare reform. 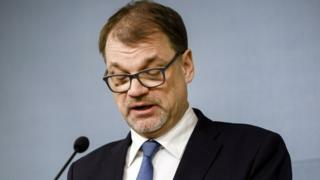 Prime Minister Juha Sipila said he was "hugely disappointed" in the outcome. Finland's extensive welfare systems are under financial pressure as the nation's population ages, yet reform plans remain politically controversial. Mr Sipila's government is expected to stay on in a caretaker capacity until a planned election in April. Some political opponents questioned the need for the high-profile resignation of the Centre Party government with just weeks to go until the election. But Antti Kaikkonen, a senior member of the Centre Party, defended the decision, which was taken after it became clear the party could not achieve its goals. "If anyone asks what political responsibility means, then I would say that this is an example," he tweeted. Mr Sipila, a former IT entrepreneur who made millions before entering politics, had previously said he would consider resigning if his primary reform policy failed. The government had hoped its planned reforms would save up to €3bn (£2.6bn) over the next decade. What is Finland's healthcare problem? In 2018, those aged 65 or over made up 21.4% of Finland's population, the joint fourth highest in Europe alongside Germany — with only Portugal, Greece, and Italy having a higher proportion, according to Eurostat. Mr Sipila's proposed solutions included creating regional authorities for health and welfare services, rather than the local municipalities that currently manage the system, and offering including private companies in the healthcare system to a greater extent to offer "freedom of choice". Mr Sipila's government also famously experimented with a guaranteed minimum income scheme – giving €560 (£480) a month to 2,000 unemployed people as a basic income with no conditions attached. Initial results suggested the pilot scheme left people happier, but still unemployed. Mr Sipila's Centre Party has been in a centre-right coalition government since 2015. Since a 2017 re-negotiation, the government has been formed of the Centre Party, the National Coalition, and Blue Reform. The opposition Social Democrats have taken the lead in recent polls by several percentage points.